Harry Potter and the Sorcerer’s Stone, the first novel in a children’s literary phenomenon inspired by a train ride from Manchester to London, resides in millions and millions of homes across the country and the globe, inspiring young minds to read and write with its wonderful, fantastical tale. My book and I are just a part of the masses, yet its fourteen years of wear mark the 309-page novel as an artifact in my library collection—it similarly outdates nearly all objects I own—and is perhaps my most prized possession. The book marks a muddled childhood and a certain dream. I remember sitting beside my mother, listening to her read an eclectic collection of stories for a seven-and-a-half-year-old. The Magic Tree House series decorated many near-21st-century family bookshelves. I later learned that educators labeled The Giver as a seventh-grade book. In the summer of 1999, before second grade, Mom came home with this now-aged copy of the Sorcerer’s Stone, saying the children’s book displayed in front of Barnes and Nobles amassed rave reviews. I recognized “Harry Potter” since I saw the Chamber of Secrets in my school library only a few months before. While reading the final chapter, “The Man with Two Faces,” Mom confessed she could not read any further, complaining it was “too long” and had “too many characters” to remember. I finished the book that night on my own. From then on, I read every story, no matter the difficulty, by myself. Examining the contents of my copy, and searching the Internet for well-known facts about the famous book series, I know what I just described is impossible. On the fourth page, on the other side of the title page, at the very bottom, reads the following: “First Scholastic trade paperback printing, September 1999”: that is when I entered second grade. A quick look on Wikipedia will show that Chamber of Secrets entered the US in June 1999; I doubt my small upper-Westchester elementary school library would receive a children’s book about witches and wizards so quickly before I left for the summer. Even if my memories are somehow a lie, that I fabricated details about some of the most vivid moments of my life, my drive to write exists, and I accredit my near-fifteen-year passion to this little tattered book. Already, I delved into the appearance of the nearly fifteen-year-old object. The cover and spine display considerably light wear-and-tear, given its age, and the edges are tattered and curled. On the front, a thin line runs between “SORCERER’S” and the bottom hem of Harry’s shirt, matching the several crease lines on the spine. The largest tears are upon the spine; while exposing the first few pages on either side, the curling edges threaten to release all its contents. On the inside of the front cover, a green Post-It note covers a sticker of a young, short-haired girl in a white nightgown reading a novel, surrounded by copious amounts of blankets and pillows, a window behind providing fair lighting for her literary escape. On the bottom, within a slightly opaque box, reads “Jaime” in bright pink gel ink; a very poor drawing of a heart in the same color ink accompanies the name. In my early elementary-school days, nearly all of my books proudly displayed this label inside their front covers, yet I could not say where you would find these other books. I must have not touched them for years. The Post-it note, a fairly recent addition to the relic, holds some bullet notes for my Classic Juvenile Fantasy Literature final exam. 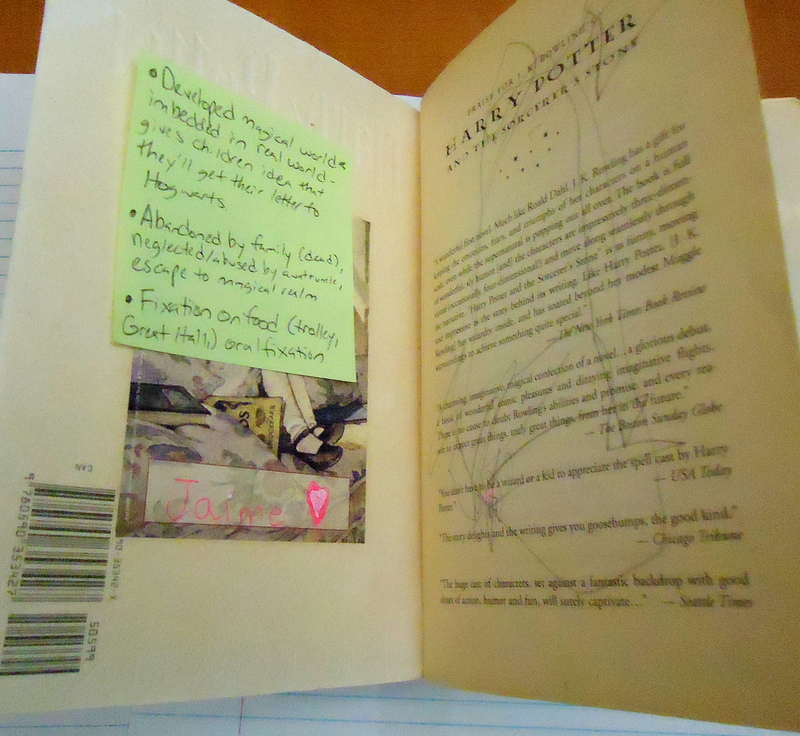 On the other side, random pencil scribbles distract from the “Praise for J.K. Rowling’s Harry Potter and the Sorcerer’s Stone.” A tiny pink splotch towards the bottom proves the child filling her name on the opposite page did not wait for the ink to dry. The yellowed pages, due to time or my father’s cigarette smoke floating around our household, make the book stand out from any other novel or collection on a bookshelf. 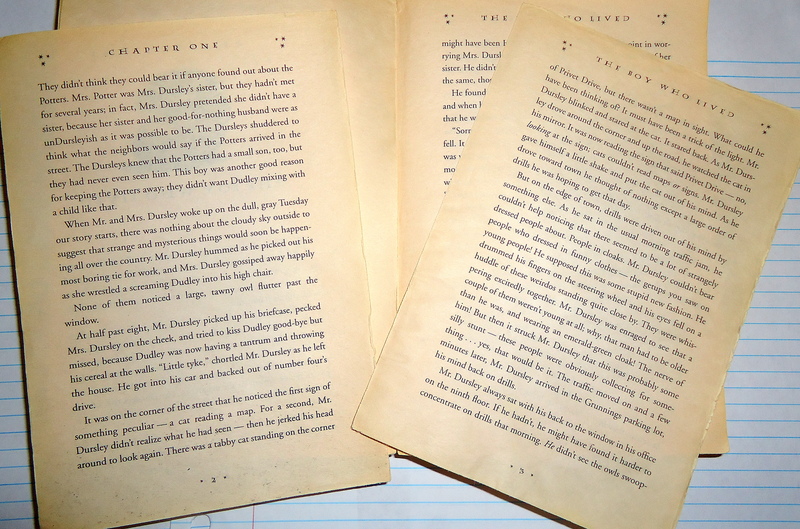 Open to the beginning, and detached sheets which describe the Dursleys and their very strange day, will fall into your hands. Bend the book; the pages and binding, used to curving in unnatural waves, will give in to your force. Slide your fingers against the sheets–work them like a flip book–and you will find random folds on the top of pages, notation of numerous readings. Good luck trying to keep the first few pages intact. This entry was posted in Uncategorized by Jaime Burns. Bookmark the permalink. Jaime, reading your post reminds me of the day I received my first Harry Potter novel in the fourth grade. Since then I have been addicted to the series, both novels and films. 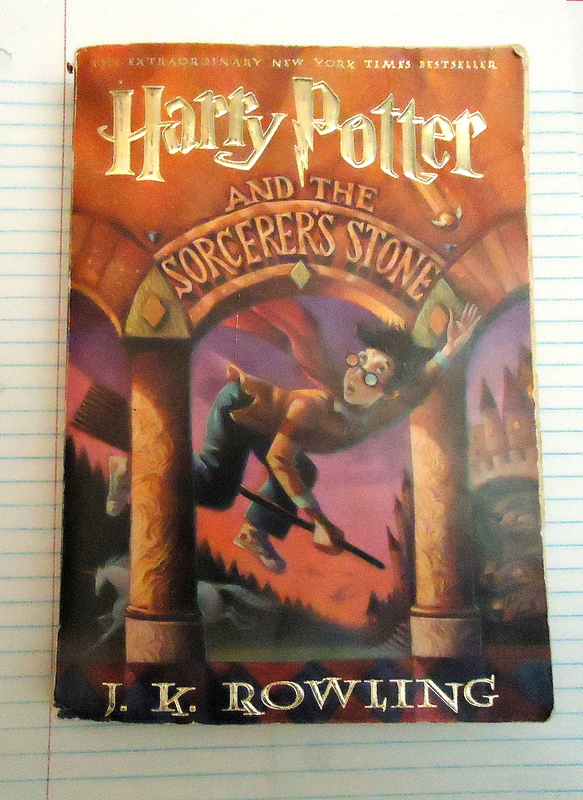 In fact, I even found my “Harry Potter and the Sorcerer’s Stone” novel over winter break in a box filled with countless elementary school reads I thought I had lost. I love your use of description in this post. From the creases on the front cover to the color of the pages, I can picture the object in front of me, even though photos are provided. I believe mine is in the same torn up stage, but I still continue to hold it as one of my favorite series too. Great job and we’ll definitely have to watch a Harry Potter film together sometime. I have the complete series! HI Jaime, i´m a spanish Graphic Desing Studen, and i need to make a poster for a contest, i was asking if i can using a picture of the these post for the porter.